If you have read the pre-steps on the previous page, you are ready to get started cooking your eggs. Take the eggs out of the fridge for half an hour prior to cooking them. 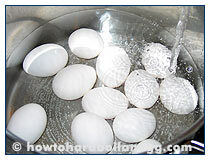 This reduces the amount shock of temperature change when the eggs are boiled, therefore reducing the amount of cracks in the shells, and seems to be helpful to make the egg easier to peel. 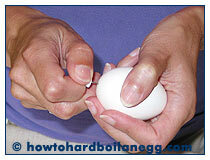 Place your eggs into a pot large enough to hold them comfortably. You will need to choose a good size pot in order to help prevent the eggs from bumping into each other while cooking. Any unwanted bumping could cause the eggs to crack prematurely. In the picture here, you can see I've chosen a nice size pot leaving the eggs well-spaced. As far as what type of pot to use - this one is stainless steel - but it doesn't seem to matter what the pot is made of to obtain a good result. I've boiled eggs in everything from glass to aluminum and the following steps work for them all. 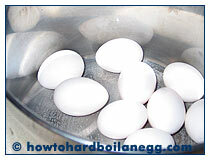 Next, fill your pot with cold water to cover over the eggs by about one inch. You can see from the picture just below that there is room left in the pot as there is no need to overfill with water or overcrowd the eggs. Add about 1 teaspoon of salt. This increases the temperature necessary to get the water to boiling and will ensure that the eggs benefit from this tempature increase to cook fully after they have set, as specified later in my instructions. Read ON! Some people have asked me if it is helpful to make a small hole at one end of the egg to help facilitate cooking. Perhaps you have heard of this too or seen it done. Personally, I have not found that it produces a better result. Sometimes I have accidentally made the hole too large, causing some whites to ooze out the end while cooking. This in turn causes the cooked and peeled egg to be a bit lop-sided. That's not important if you are making egg salad, but for deviled eggs you like the cooked white to stay nice and round. (Discard any of this oozed-out debris with your cooking water once you are finished cooking the eggs).